Porcelain Bear is a Melbourne based design studio specialising in porcelain. Founded in 2010 by ceramicist and designer Gregory Bonasera as a sub-brand under which to market more commercial projects while more unique works sold under his own name, the sub-brand became THE brand when a little later Bonasera met industrial designer Anthony Raymond. The label has since become synonymous with extraordinary works in porcelain that push the limits of what is possible in this notoriously difficult material. In 6 short years the duo have taken their initially small offering into new and exciting areas that now include large items of furniture and other products rarely, if ever, attempted in porcelain. Location photography by Sharyn Cairns. Product photography by Mike Baker. An example of the double pillared 'Metro' coffee table that combines curved porcelain tiles in a brick pattern style with a dark grey marble called Pietra Grigia. The bowl is called 'Fruit Tree' and is also by Porcelain Bear. The most recent addition to the Porcelain Bear collection is a room divider / screen based on metal chains called ‘Enigma’ (seen below to the left of frame). Made from glazed porcelain links 19mm in cross section, the design takes what is perceived as a delicate, breakable medium and turns it into something physical and robust, while retaining a diaphanous appearance. The screen is assembled in a pattern of small and large links that lends it a woven textile feel. Due to the design the screen can only be disassembled from the bottom up a link at a time so there is no danger of the screen cascading to the ground inadvertently. 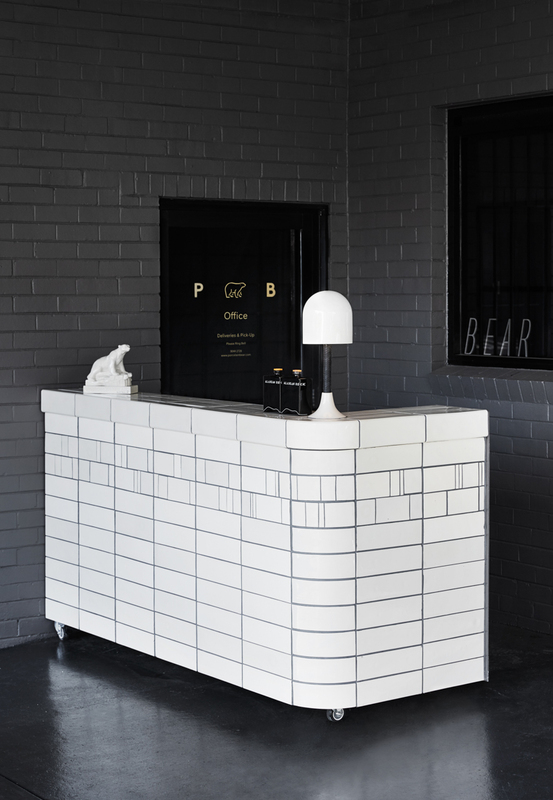 The new "black" room at the rear of the Porcelain Bear showroom in Melbourne's Collingwood. Their latest project has been the remodeling of their Collingwood showroom and an addition of a new space they term the “black” room. The main showroom now features weathered recycled timber floors laid in a herringbone pattern while the black room takes this idea one step further, charring the parquetry floor with a blow torch. 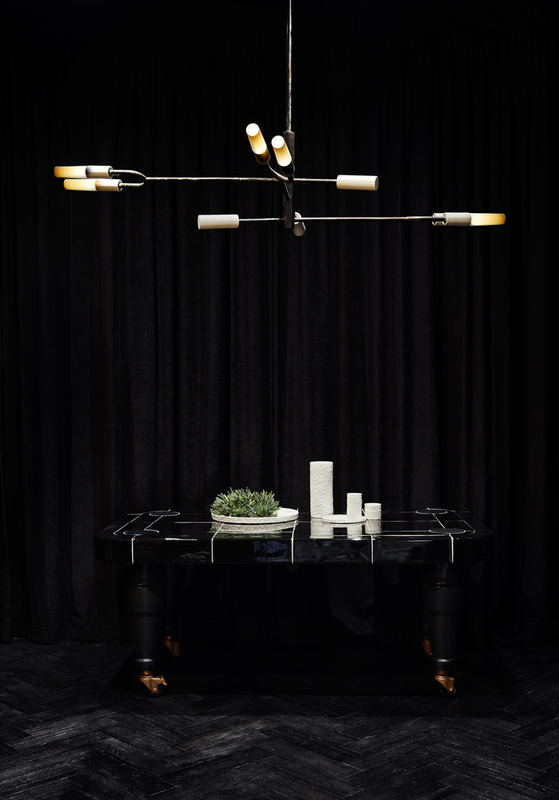 Featuring some large black and white glazed porcelain pieces with 24 carat gold light fittings and heavy charcoal coloured linen curtains, the room is dark and opulent - a perfect fit with Porcelain Bears unique porcelain pieces. An example of the 'Metro' dining table with a more heavily veined stone base and top in Giallo Sienna marble. The entrance to the black room is quite dramatic through black steel and glass French doors with white bone china handles cast from the thoracic vertebrae of a cow. The new 'Enigma' chain link room divider / screen by Porcelain Bear. Over the last few years Porcelain Bear have also been commissioned to produce custom furniture and lighting items for several hospitality projects including Sydney’s Henry Dean at the top of the Palisades Hotel and Melbourne’s beautifully executed Smalls Bar, along with custom porcelain lighting for the highly acclaimed but now sadly closed Melbourne CBD restaurant, Prix-Fixe. 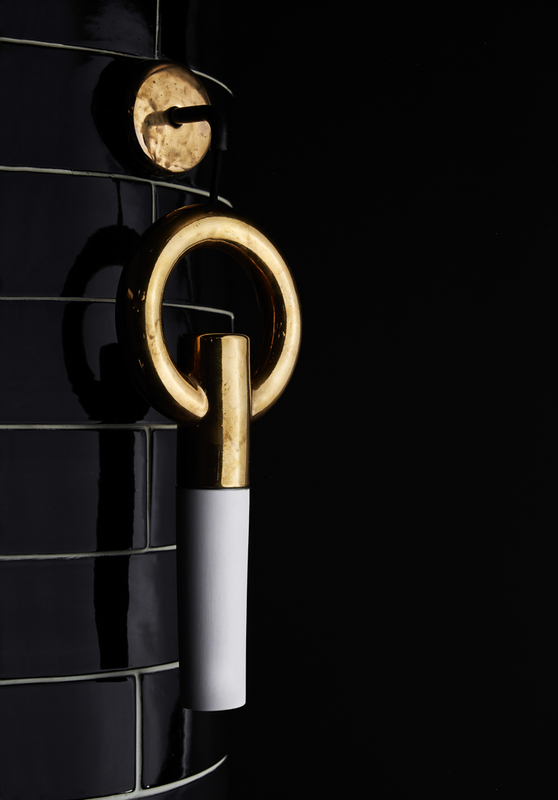 The brand has shown their work around the world at design events such as Thailand Design Week, DesignTide Tokyo, 100% Design in London and Ventura Lambrate as part of Milan Design Week. Porcelain Bear also contributed work to the first of Dale Hardiman & Andre Hnatojko's 1-OK CLUB limited edition design exhibitions last year. A grouping of 'Metro' side tables including (L to R) 'Slender, 'Burly' and 'Butch'. The grout can be specified to contrast or match to create different effects. The stone variety can be specified. Before Bonasera and Raymond started working together they were both independently studying and participating in design. For his part, Bonasera graduated from Monash University in 1988 with a Bachelor of Arts Degree in Ceramic Design. Early in his professional career, he was awarded a three month studio residency in Northern Italy through the Australia Council’s Visual Arts Board. He later added CAD to the host of traditional ceramic skills he practiced so that Porcelain Bear were in a position to work across a range of projects from historical restorations to contemporary commissions - in addition to the brand's own collections. 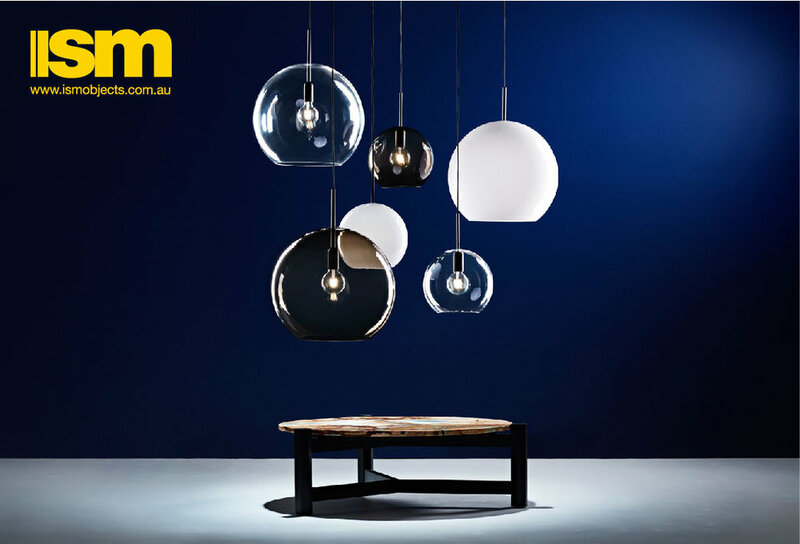 Raymond was also a Monash graduate, completing a degree in Industrial Design in 2003. He has studied in Prado, Italy as part of scholarship with Japanese audio-visual giant Kenwood, and interned with the same company in Tokyo. After these international experiences, Raymond worked as a freelance graphic and web designer before joining Porcelain Bear in 2010. Raymond's role within the company focuses on product design and development while Bonasera handles the technical aspects of plaster mould making, firing and glaze testing. Their seperate abilities dovetail into a united aesthetic which they constantly work to refine. Their highly original products benefit from the longevity that comes when working in a material that is thousands of years old and which relies on techniques that go back hundreds of years. The fact that they work in CAD and test their shapes using 3-D printers takes nothing away from the feeling of a beautifully executed ancient craft. In a world of impermanence it's wonderful to come across objects that might well last into the next century while offering exciting new ideas. For more on the extraordinary work of Porcelain Bear check out their website here. You can see some of their custom work within projects by Fiona Lynch Office here and here.